Gorgeous weather, family, a cute babe, and lots of food. That pretty much sums up our Easter weekend. For months Rowan's Easter outfit has been hanging in his nursery waiting to be worn. It was one of those outfits that you just can't pass up. Fast forward to Sunday morning as we were hurriedly getting ready for Church (we're never, ever on time) and our little chunker barely fit in it! We squeezed him into it anyway with the cutest penny loafers ever, which kept falling off. I can't even... That face! He naturally didn't notice his Easter basket but we had to document it anyway. I put on my face, switched dresses last minute because my post-baby body just didn't fit in my favorite coral dress like it used to, and posed for some family pictures. 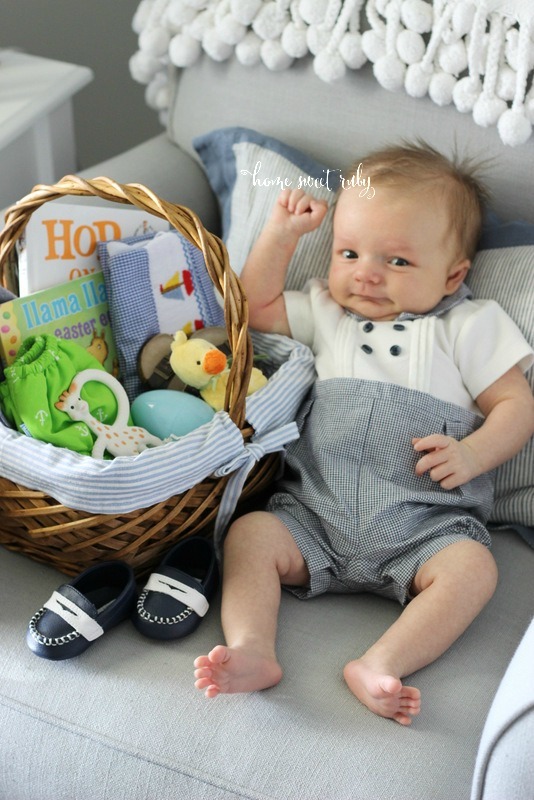 But one of my favorites from Rowan's impromtu Easter photo shoot... because his face and that lean is just too damn good. 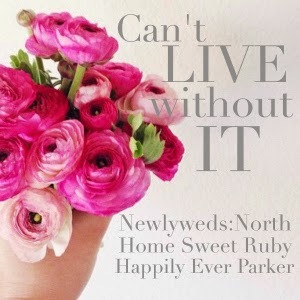 And in other, fun blog-related news... Stephanie, Laura, and I are joining forces for a weekly link up starting this Friday! It's super easy after a long week, just share one thing you can't live without! Note: Wine, Target finds, or the comfiest pair of yoga pants all count. Hope to see y'all link up this week! He is just too darn too =) sounds like the perfect Easter! oh my, Rowan's face is amazing, I just can't even! So glad y'all had the best Easter! And yay for the link up on Friday - can't wait!! Perfect family photo, so impressed with a dog and baby!! And those cupcakes look amazing. Happy Monday! 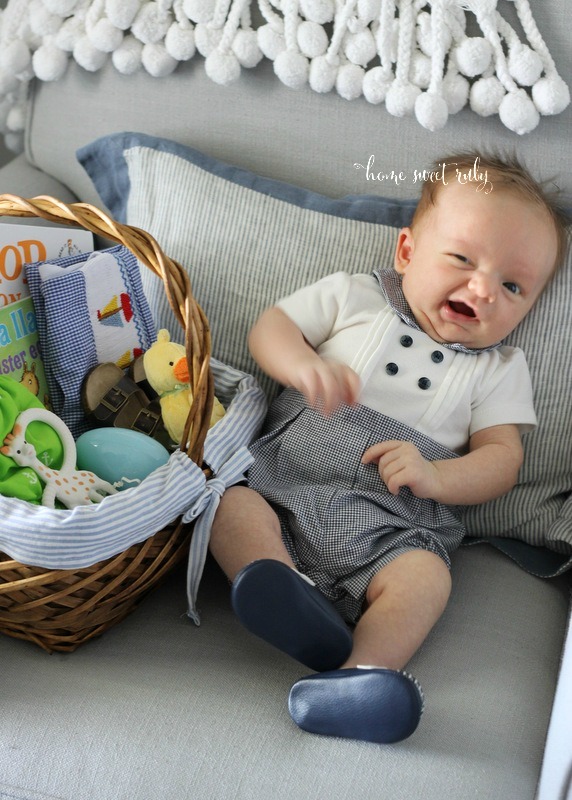 Rowan looks so adorable in his Easter outfit! Great family photo, pup and all - perfect!! His outfit and that family picture? Stop it right now! Glad you guys had a great holiday! You guys are adorable! And you look fantastic! Rowan is just too cute in his Easter best! Great idea for a link up! those baby loafers... too much cuteness!!! That family photo is adorable..and his faces! haha! he is everything! cant wait til friday! Umm you look fantastic!! Love little Rowan!! Such a great family picture!! Love Roman's little outfit, too! Love that leaning picture of Rowan...too funny!! And what a great family picture, such a beautiful family!! Those cupcakes are so perfect looking... I must learn! Glad you guys had a great Easter! Oh my gosh, that family picture!! Love it! Could he be any cuter? Glad you guys had a great Easter and looking forward to the link up on Friday! You got such a great family picture!! And your post baby bod is fabulous. Don't be beating yourself up over there! Also, his outfit. Adorbs. Fun linkup! I love all three of your blogs! That last pic has me cracking up!! Love your family picture! Framer for sure! Those cupcakes look like a professional made them. You need to go in business! Oh my gosh! Your little guy is SO cute!!! 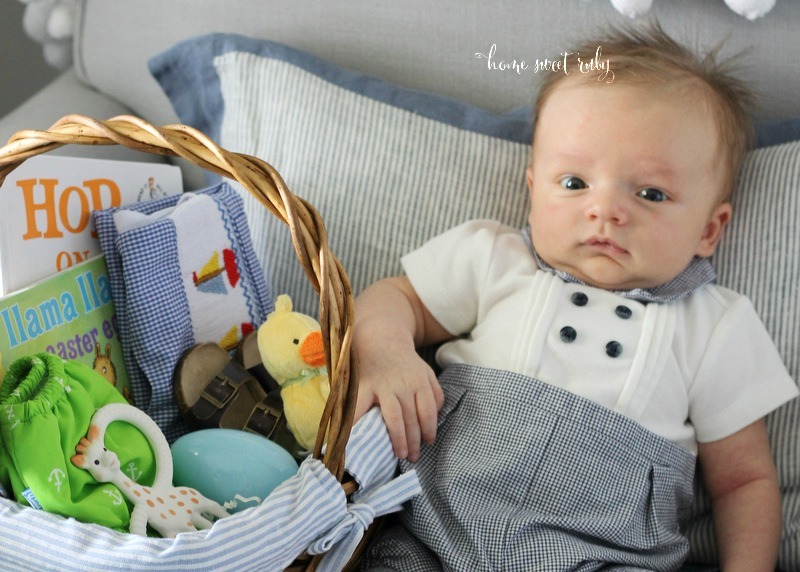 And luckily he fit into his Easter outfit :) I can't wait to join in on the linkup!! yayyy! That last picture of Rowan... I can’t stop laughing. That’s amazing. Love y’alls little family photo! His Easter outfit is the cutest! Glad it fit well :) Also, you make the prettiest cupcakes! He is precious! Love the outfit! Looks like he had a great first Easter. Looking forward to linking up with you on Friday. I seriously cannot get enough! What an absolute doll!